... with others your pleasure in God’s glorious world. Flowers at Church celebrate God’s goodness and gifts to us all; they are a fitting reminder of his glory and grace. 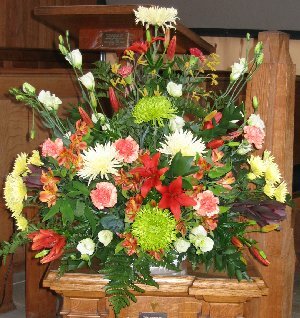 Flowers enhance the service and uplift our spirits as people come into the church and during the services. After the services are over those flowers give further pleasure, because they are given to people in need of special pastoral care. • sponsoring flowers in celebration or in memory of an event or anniversary, with or without a preferred arranger. If you are a taxpayer the church can recover tax on your gift if you are willing to fill in one of the readily available Gift Aid envelopes. 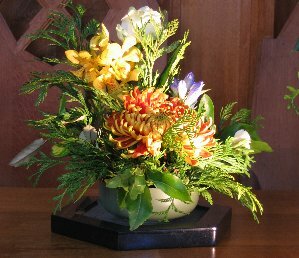 We operate a rota for the arranging of flowers. 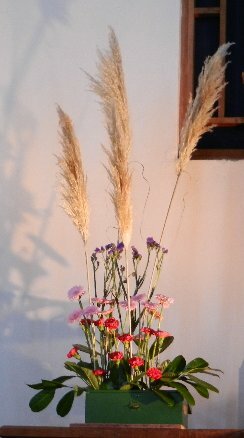 If you enjoy flower arranging and could spare some time to do it a few times a year we would be very pleased to hear from you: please contact Catherine Wright or the Church Office. If you aren’t able to arrange flowers yourself, a donation of any amount would be gratefully accepted, or of a floral arrangement made by a florist. Catherine can recommend a florist who will give a discount. Particular dates may be available if you wish to provde flowers to commemorate an event or a loved one. Please ask the office in good time to book your hoped-for dates. It is also possible to have the significance of the flower gift mentioned in the church Notices and on screen for that Sunday if that is your wish. Please let the Church Office know by the preceding Wednesday. For further information please contact Catherine Wright or office|email the office.